It's been a long time since I've had Spanish tapas that were not created in the lively kitchen of Jose Andres' reknowned D.C. restaurant, Jaleo. 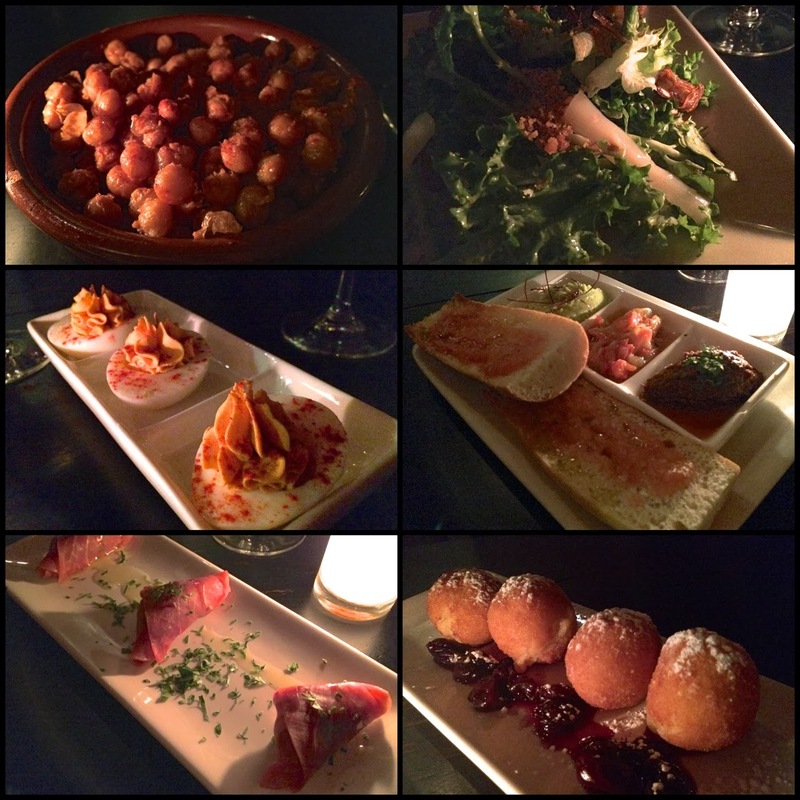 So good is Jaleo, that if I'm in the mood for Spanish small plates, that's where I head. So it was refreshing to try something different during a recent New York trip. Tía Pol was started 10 years ago by Heather Belz and Mani Dawes as a way to bring their favorite flavors of Spain to New York. According to the restaurant's website, Tía Pol's tapas span styles across Spain. The menu includes traditional favorites like garlic shrimp, fried potatoes and Spanish potato omelet. The menu is comparatively simple and much shorter than what you'll find at Jaleo (this is, after all a sliver of a restaurant compared to Andres' expansive Penn Quarter outpost). But I wouldn't dare call it limited. We found a lot to love during our recent dinner. A chalkboard near the entrance outlines daily specials. Our favorite dish--in fact, our favorite thing we ate on the trip--was beef shortribs braised in red wine and served with mushrooms and parsnip puree. The meat was exquisite: tender and flavorful and nestled in the velvety slightly sweet sauce that was a perfect match for it and the mushrooms. "This is the best thing I've eaten in a long time," exclaimed Chris. We were sharing our plates, but I could tell he'd have been happier with a portion all to himself (me too, frankly). Most everything else we had at Tía Pol was really good too. The evening was off to a great start with Serrano ham trianges stuffed with artichokes and manchego cheese. The deviled eggs were delightful, sprinkled with smoked paprika. In both cases though I wish the restaurant served an even number of bites rather than bringing a plate of three for a table of two--the restaurant is mostly two-tops after all. Splitting one of the deviled eggs resulted it being completely mangled. Fried chickpeas were a great snack to enjoy throughout the evening. Another standout was the grilled baguette spread with garlic and served with three salsas: olive tapenade, pea puree (at least I think it was peas) and our favorite, a sweet spread of roasted red pepper and onion. The only dish that disappointed us was the crispy artichoke and white asparagus salad. The components were delicious, but too much salt sunk the dish. We ended the evening on a good note: a plate of fried custard balls served with "drunken" cherries. Thankfully the plate of four made splitting this one easy, for we'd otherwise surefly have fought over the last one. The restaurant is small, so I definitely recommend reservations. It's also rather dark, as you can probably tell from the pictures. So, while this creates a romantic atmosphere, you might want to bring extra light to read the menu (our table's little candle was barely adequate, making menu-reading an exercise in finding the angle that captured as much light as possible). Tía Pol, 205 10th Avenue (at 22nd Street), New York, N.Y. (Chelsea). (212) 675-8805. Reservations: Open Table. This was a fantastic meal. Best ribs I've ever eaten -- and that's no exaggeration. I hope I didn't take more than my share.